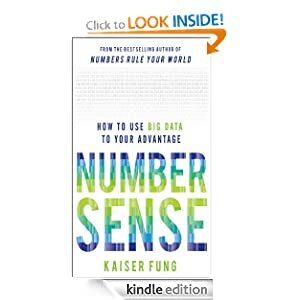 Kaiser Fung has a new book coming out: Numbersense. It’s a word that those of us in applied work refer to in various ways as “a nose for data” or “numerical common sense”. This is his second book. The first was Numbers Rule Your World, and Kaiser has a long-running blog with the same name. Fung thinks of number sense as one of the three things he looks for in a data analyst. The first two are technical ability (statistical knowledge, programming knowledge) and business thinking (hey, how are we going to make a profit here)? “Numbersense is that noise in your head when you see bad data or bad analysis. It’s the desire and persistence to get close to the truth… the wisdom of knowing when to make a U-turn, when to press on, but mostly when to stop. So Kaiser sets out to teach this by example in his new book. In some ways, this is similar to Nate Silver’s book, The Signal and the Noise, but Fung is a bit more into the careful dissection of the strength and weakness of particular arguments. Because I’ve spent a long time in marketing, I started with a chapter discussing the Groupon business model. I’d covered Groupon in my marketing research classes when the IPO frenzy was at its height – not only was the topic of great interest to my students from a marketing angle, Groupon was hiring locally then and some of their friends already worked there. In the class, we discovered Groupon really wasn’t doing any sophisticated targeting – whether you were in your 20s, 30s or 60s, whether you lived in city or suburbs, or were male or female the students and I were all getting the same offers – they were sometimes in different spots on the page, but they were still the same offers. No complex targeting there. So why wasn’t there better targeting, since that was the claimed technical advantage of Groupon? Kaiser lays out the reasons for this clearly. The essence of targeting is finding exactly the right people. But finding a few perfect people doesn’t make as much money for Groupon; they want you to advertise to more people. And the ads I want to see as a consumer are those for things I already buy, but the customers businesses want most are people who produce a marginal sale – i.e. those who wouldn’t already buy. Thus, inherently the business model is in conflict with itself and would be expected to have problems. It’s a great dissection, and I found a few points there that I’d missed when I’d thought about it earlier.